I've been shooting the night sky, in one form or another, for close to 20 years now. Starting with film and moving to digital imaging when equipment became commercially available. After being an early adopter of CCD imaging I've since moved on to DSLR imaging with fair success. The equipment used for all of the telescopic images consists of an 8" f/4 Schmidt Newtonian telescope on a goto german equatorial mount, the cameras used were an old Yashica 35 mm, a CCD and a DSLR as noted on the image details. 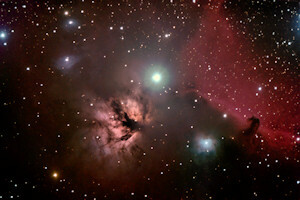 The wide field images were taken with a Canon DSLR piggybacked on the telescope with a variety of lenses.